Poo-Pourri: All-natural spray deodorizer eliminates bathroom odors. All-natural spray deodorizer prevents odors from escaping the toilet. Forget the silly name. Poo-Pourri works. Spray a few spritzes on the surface water of your toilet before you go and no one will ever know about your dirty business. The all-natural blend of essential oils creates a barrier that prevents embarrassing odors from ever escaping the throne. The manufacturer is so confident that they offer a 30-day unconditional money back guarantee. Poo-Pourri is available in two styles: Original (packaged and scented for women) and Trap-a-Crap (packaged and scented for men). Both styles have the same odor-trapping power. 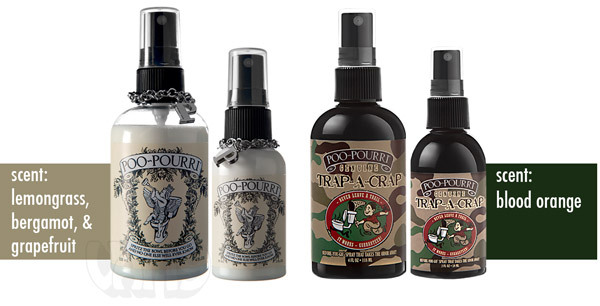 Original Poo-Pourri and Trap-a-Crap are available in 2-ounce and 4-ounce sizes. 0:48 - Please note the Trap-a-Crap packaging has changed since this video was made. 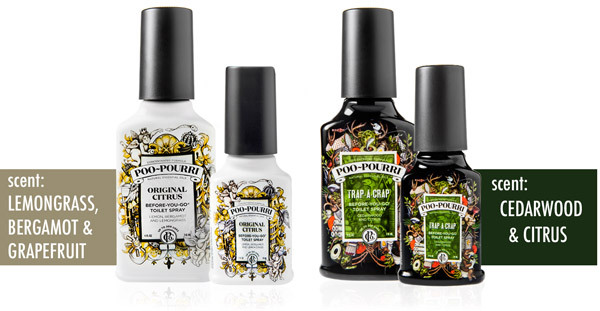 You may buy Poo-Pourri because it has a funny name. But, give it just a single try and you'll be convinced that it's magic. 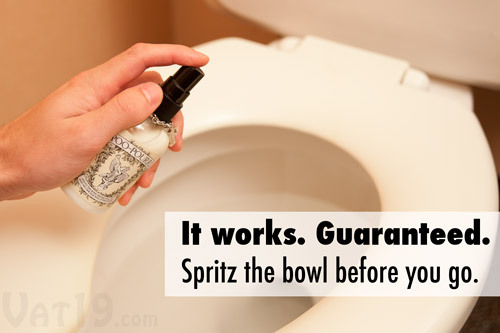 Here's how it works: spritz Poo-Pourri on the surface water in your toilet BEFORE you go. 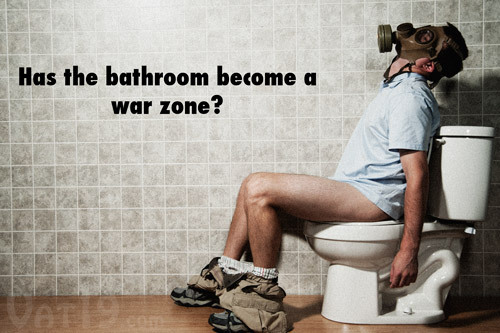 It creates a barrier of all-natural essential oils that prevents odor from escaping the toilet. Most air fresheners and deodorizers attempt to mask odors after they've been let loose into the wild. With Poo-Pourri, you have the inherent advantage of knowing when the stinky "event" is going to take place. Now you can do something about it! Simply spritz Poo-Pourri onto the surface water before you go and no one will ever know! It seriously works. Or your money back! Do you know somebody whose digestive system seems...overly vigorous? You know who I'm talking about. It's the guy who can clear out the entire floor of an office building. Well, Poo-Pourri was designed to handle that guy and anything else you can throw at it! The manufacturer is so certain that they offer an unconditional 30-day money back guarantee. If it doesn't work like the magic elixir that it is, let us know and we'll take it back. With Poo-Pourri, the bathroom may take on a whole new set of possibilities. Poo-Pourri is available in two styles/scents: Original and Trap-a-Crap. Both the Original and Trap-a-Crap have the same odor elimination power. The differences are mainly in the packaging design and fragrance. Both are available in 2-ounce and 4-ounce bottles. Original: Lemongrass, bergamot, and grapefruit. Poo-Pourri is available in two styles: Original and Trap-a-Crap. 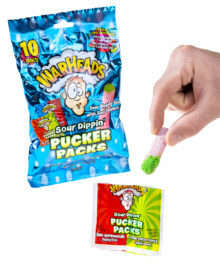 Question: This is gross. You're talking about bowel movements. Answer: Was that a question? Listen, prissy pants, everyone poops. But everyone doesn't need to know (and take cover) when it happens. 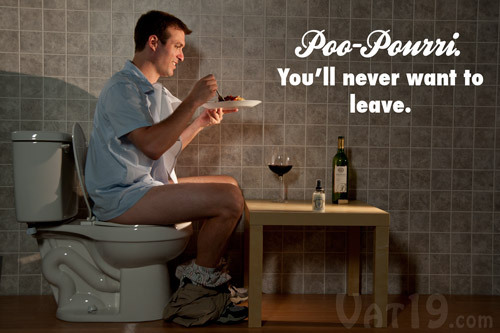 And that's where Poo-Pourri comes in handy. Now you can do your business without blanketing your entire house or office with your stench. 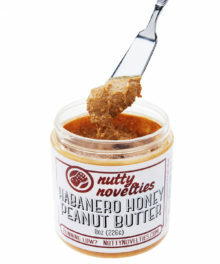 Question: So, does this $%*# actually work? Answer: Yes. 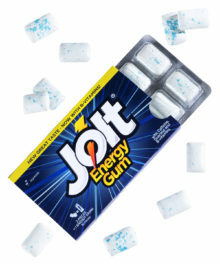 And we tested this stuff thoroughly. With Indian food. If you don't believe us, perhaps you'll believe the manufacturer who backs Poo-Pourri with an unconditional 30-day money-back guarantee. Question: What's the difference between Poo-Pourri Original and Trap-a-Crap? Answer: The scent and packaging. The odor eliminating powers are equal. Really, it's just a matter of preference in terms of style and a lemony fragrance (Original) versus an orange-y fragrance (Trap-a-Crap). Question: I have a ... friend ... who drops some serious stinkers. Will this really work? Answer: The manufacturer spent two years perfecting their formula and it was time well spent. This stuff works wonders. Independent testing from The Chicago Tribune, Glamour.com, and several of my own over-indulgent visits to Saffron Indian Cuisine Buffet attests to its odor-eliminating power. Question: How many uses do you get from a bottle? Answer: You'll get approximately 100 uses from a 2-ounce bottle. 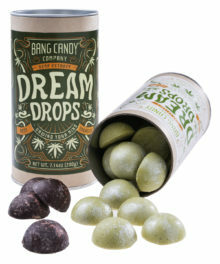 The 4-ounce bottles will yield 200 uses. Ultra-compact and portable power napping pillow.